It is a fact that damaged intervertebral discs seldom heal, as the discs are constantly under pressure, even while you are at rest. Spinal Decompression Therapy uses clinically proven principles to non-surgically decompress the spine and reduce the pressure inside the discs. Decompression, or the reduction of pressure inside the discs, facilitates the transfer of fluids, nutrients, and oxygen back inside the disc and results in the retraction of bulging or herniated discs, providing welcome relief of nerve pressure and assists the natural healing of the disc. Previous research of this technology found that the treatment provided good to excellent relief in 86% of patients with ruptured intervertebral discs and 75% of those with facet degeneration. All treatments are administered with the patient fully clothed. The patient is comfortably positioned on the table and the security belt adjusted to comfortably secure the patient’s spine. 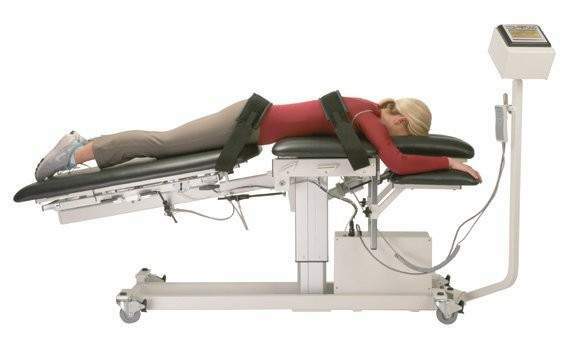 For lumbar decompression, the upper torso is captured by a comfortable securing system incorporated into the table. Both the pelvic and cervical support sections can be tilted, so that specific spinal segments can be targeted. With precise accuracy and tension controlled by an attached computer, the specific disc segment is gently distracted to reduce the pressure inside the disc. Most patients will find relief of their symptoms after just a few sessions, and alternating chiropractic adjustments. All treatments are finished with 10-15 minutes of icing. Most patients are able to return to normal levels of activity at work or recreation in just a few weeks time.